Many people speak of trekking in the north of Thailand, but such over-popular options are not the flavour we go for. Instead, we had read of tours starting from Bangkok that would combine the amazing jungles around the Burmese border with a trip to the Bridge on the River Kwai and the Death Railway. Our trip started out with a small bus full of people. What would this be like? The trips we had been on in Vietnam had essentially disappointed. Our first stop was a hotel, a real hotel. It was in sight of the bridge itself and against the water’s edge. We found out that the other people in the group were not on the same trip and this one was going to be just Cesca, the guide and myself. We were taken via tuk tuk to the company offices for the first part of the adventure: the bike ride. Having been bitten by the quality of bikes in Vietnam, where my velocipede had fake suspension, I was not expecting much. However, I was pleasantly surprised to find that these were brand new high quality bikes. With a happy check of the brakes I jumped aboard as did Cesca and the young female guide. We set off down the road and towards a local museum where we read about the horrors the Japanese brought to this area. Across the road sat a large cemetery to the war dead and we solemnly walked around this. Then we set off out of town via an exceedingly pleasant and winding route through local villages and country roads. I was really enjoying myself, when we got to a very heavy climb. I wondered at the route choice, but once to the top it became apparent. Off the road began a large Buddhist complex built into the natural caves dotted around the area. Lined with large statues we cycled into this zone and up to a couple of somewhat bored looking monks guarding the entrance. The guide paid for us and explained that we were about to visit a large natural cave series that is used as a temple. “What are the monks doing?” I asked. “They are making bracelets,” she answered. We both obeyed and I considered the gift. It was not my normal fashion to wear a bracelet other than my Tactical Man Band, a leaving gift from my good friend D, and I suppose that is the heart of the matter. I cannot wear something that has no meaning. I do not wear anything just for the ‘look’. It has to mean something, have a story. On the other hand, I am a philosophical Daoist and wearing a Buddhist bracelet is an expression of that. I wear it to this day. Cesca added it to her collection and suddenly had an idea. She now sports many bracelets from our travels and they all mean something. Anyway, the guide led us into the caves and we wondered at the size and shape. At once narrow, certainly for a big westerner, and yet they go on for hundreds of meters. Inside all sort of Grottos resplendid with icons and statues, keep watch over the dripping and damp silence. We were led down and around and eventually to the basement. Here sat a large Buddha peacefully overlooking the depths of the Earth. We hung around for a few moments before making our way back up via a different route that brought us out south of the bikes. Then we hopped back on the bikes and were away to another cemetery. All the war graves here are in amazing condition. Mainly thanks to the efforts of the Australian and Canadian nations. This one was particularly beautiful with a well-kept lawn broken up with small clean stones. It was a special place and I am glad we visited it. I realised that this trip was going to get more soulful with the coming visits organised for the afternoon and the following day. With that on my mind, we rode back down the hill towards town and the bridge itself. 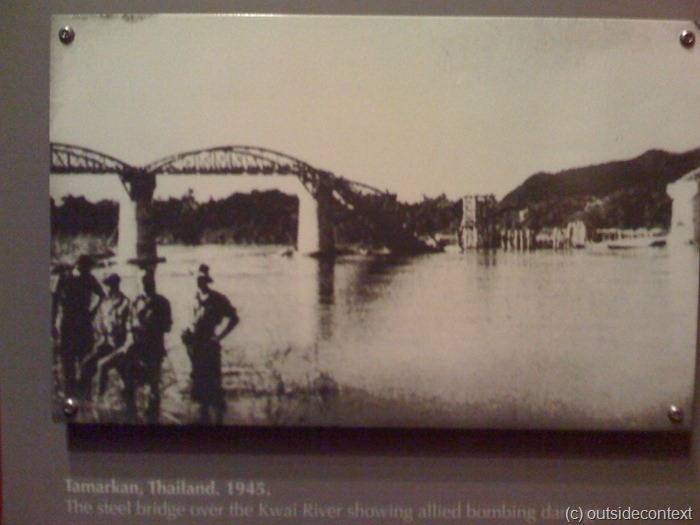 For a movie buff, the Bridge on the River Kwai is famous more for its appearance in the classic war film of the same name. A seminal fable of British resiliency and the ‘proper order’. The truth is not so comforting. Firstly, the bridge was not blown up by commandos, I can assure you of that, it was hit by the RAF, but not out of action for long. 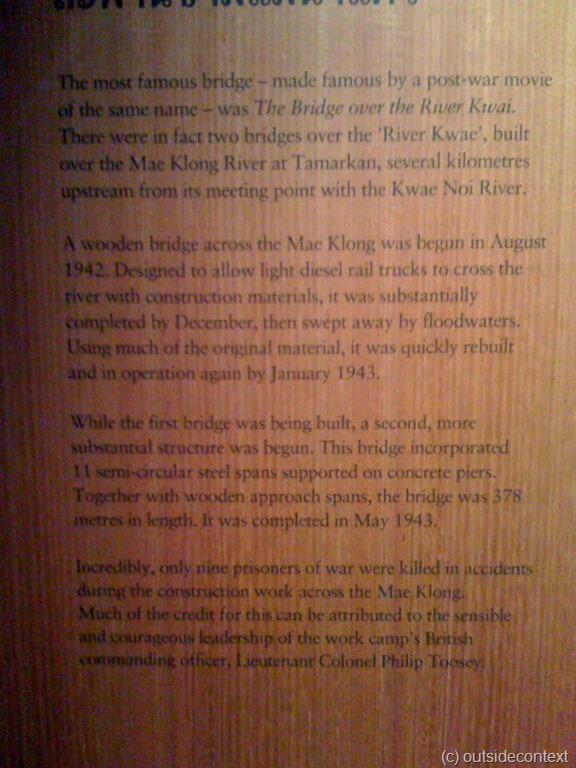 In addition, unlike the film, the British did not design the bridge or lend the knowledge to the Japanese to build it. Rather they were simply used as hard labour. Indeed the Japanese have been excellent engineers for many centuries. Moreover, I once saw a program that featured British survivors of the camps in this area and the portrayal of the senior British officer, by the late great Alec Guinness, is not only unhistorical, it is actually an insult to a true hero. The men on the program swore that he saved them all, and was nothing like the character in the film. This is what I knew, and what I understood of the story before I got there. I thought that was moving enough. What I learned was the next day was harrowing in the extreme. However, before then: the bridge itself. Every night a train service crosses the Bridge on the River Kwai. The bridge itself is still standing in good condition and arrayed around both ends is a concrete area laid with tourist things. We stood and watched as the train crossed and all around us people took photos and video of the event. Then we walked across it. This is the sort of thing that is allowed in your average South East Asian country. In England, stupidly soft that we have become, it would be deemed too dangerous and fail some sort of safety audit and be closed. It was breath of fresh air to be able to somewhat take my life in my hands and walk the structure. The stone pillars holding up the newer iron bridge are all that remain of the original bridge, but it still reeks of ages past, of Victorian style building, Brunel and so forth. A remnant of a bygone age. After the Bridge we cycled back to drop off the bikes and then visited a swimming pool in a nearby hotel before dinner and turning in for the night. The next day brought a bright sun and a more bus-orientated day. We started with a visit to a waterfall where we encountered a very large and friendly praying mantis, followed by a visit to Hells Gate. During the war, the Japanese were planning to invade India. Quite how they were going to manage that feat will never be known, but the plan involved the moving of vast amounts of war weaponry and supplies to the borders of Malay so that they might invade across the Indian Ocean. The smart and easy way of it would have been to ship the equipment around the peninsula of Singapore (which had fallen) and into the Malay waters. However, the British had broken Enigma and with it had broken the Japanese codes. Using this knowledge, the ships would have almost certainly been sunk. Therefore, the Japanese made a desperate gambit; they would build a railway through the mountains and jungles of their concurred lands that would connect the forces and remove the need for shipping. Building a railway through the harshest jungle in the world is no mean feat. It required a steely iron determination and a shockingly large amount of engineering knowhow. The knowhow they got form the European school before the war. The determination they had in spades. They also had two types of labour. Hired Indian workers and captured Allied Prisoners of War. To the Japanese this was a perfect force to clear the jungles for the railway. They forced the POW’s to work, something they are not supposed to do in the conventions, and slowly the great task of building the railway was begun. That is about as apologetic as I can get in describing this event. The truth is not so easy to stomach. The truth is that the Japanese had no respect for foreign life whatsoever. The truth is that they worked the POW’s to death, fed them very little, gave them no care and attention and beat them mercilessly. Thousands died of tropical diseases, malnutrition, being worked to death and being murdered by the Japanese. For the men working on that railroad, it was hell. The most infamous spot was Hellfire Pass. Railroads always have trouble with hills and mountains. The usual practice is to use heavy machinery to dig out such hills, but the Japanese decided that one particular hill would have to be dug out by hand. This was the most arduous work imaginable. The weather here on the Burma border is pure jungle heat. Wet and hot. Wounds opened here would never heal; in fact they would fester and grow. Illnesses here would include all sorts of parasitic infections, stomach bugs that would cause internal bleeding, dysentery, unsafe water, heat stroke and the ever present over arching killer that is Malaria. Moreover, if that was not enough, the railroad got behind the ludicrous schedule and the Japanese government declared that the POWs were “lazy” and would have to be worked harder. This was known as “Speedo” and the directive meant that the guards beat the POWs constantly. Constantly. Without letup. People were only allowed off work if their stools were flooded with blood, else they were beaten to the line and forced to work to their deaths. So what is left of this horror? What remains there now is a very high-class museum dedicated by the Australians to their countrymen who died in that hell. A full audio tour and walk around the site is included in the entrance ticket and it has survivors of the horror telling their tales. These tales tend to the heart breaking stories of individual courage: the doctor who saved lives, the captain who died for his men. Access to the site is hard enough, it being down the side of a steep staircase running around the hill and any visitor to here in the summer would perhaps feel a 10th of the discomfort felt 24hours a day the men who died here. Even now, I felt that I was in a crime scene. It is almost unbelievable to me that the Japanese, in my lifetime a gentile and kind race, were these manic imperialist killers. After walking down through and back up, Cesca and I stopped for a litre of water each. Fluids just disappear from your body here and it was vital that we had enough water for the day. Our next part of the adventure had begun. We were driven to a staging area and then picked up by our guide and a local villager. He arrayed us with water and then we were off into the jungle. Trekking is something Cesca and I love. It gets you out of not only your comfort zone, but out of your mental map of yourself. You are immersed in the sights and sounds of the trek and have plenty of time to think. This was real trekking. The villager spoke almost no English, but our ever-helpful guide translated splendidly. The jungle was all around us and I could not see that we were following any sort of recognisable path through it. After a while, the villager cut us down some bamboo and fashioned us some walking sticks, something that really helped. We crossed rocky rivers, went up and down rocky slopes, through valleys, up hills and everywhere the jungle was all around. No signs of human life. I really felt that we were really in the mix. Of course, we were probably only a thick bush away from Starbucks, but it felt real. What also felt real was at one point we were crossing this giant fallen log, using it as a bridge over a massive drop, when the villager and guide both froze. In front of us was an enormous snake that spotted us and slithered into the undergrowth. It was about 5 feet long and looked to me like some sort of pit Viper with its arrow like head and hissing out a warning to us. It disappeared and our hearts stopped hammering in out chests. Relieved and laughing a little we all continued. About 7 hours later, we came to a stream. There the villager stopped and made some cups from bamboo (I still have mine). Into these, he poured some local firewater and we drank each other’s health. It was strong stuff and that is putting it mildly. He then led us onwards and out of the jungle into pastures. Through these and onwards to a small purpose built wooden village. This was arrayed with bamboo huts into which we deposited our gear. To wash we went down to the river and washed standing in the freezing waters. Not the safest thing I have ever done, but I was at least clean. The next morning, we were up and at them at an ungodly hour. I am not the most morning orientated of people and struggle to wake up. This morning, they had what must be the ultimate way of sobering me up but not in a good way. The guide called me over to a mud bank where the villager was violently digging out a hole in the ground. It looked vaguely familiar. My recollection had been that I had indicated a certain level of reluctance on the part of spiders in my room. Quite how this turned into me wanting to see one was lost to me. However, before I could stop him the violent digging stopped and the villager was now poking a slim stick into the hole. I was fascinated to see how he flicked the stick in a certain way and ground it around the hole, but I could not see into it myself. Suddenly he cried out and jumped back as an enormous and very angry spider came out of the hole. Spiders are naturally nocturnal and this big fella’ had been woken from his morning slumbers by someone knocking down his home and dragging him out by force. He reared up and waved his legs menacingly. I instinctively took a step back. He was huge and black and about the size of Cesca’s hand. I would bet that he was some sort of Tarantula, but I don’t know. The villager was not so hampered by fear and he pushed the stick under the beast and flicked it up and out of the hole, onto the bank. The spider made a dash for it, but the villager was ready and it reared again. Fangs the size and shape of clipped big toe nails juddered as he tried to scare us off. The Villager was having none of it and with a very deft and practiced movement, he slapped the stick down on the spiders back and pinned it to the floor. He then rushed up the stick and grabbed the spider from the back holding it down. He then gripped it in a certain way, obviously some sort of spider jujutsu hold, and lifted it up in his hand. The spider was totally in his control. Satisfied, he smiled, walked over and thrust the struggling giant arachnid in my face. “That his balls you’re holding,” I pointed out. Both Cesca and I made the same face of disgust, and had we been Christians, we would have made the sign of the cross. And that was that. As we tucked into the mercifully spider free breakfast fruit one of the villagers was cutting into some bamboo and drawing a long thread from the flesh. Sur enough, he was. Using a skill passed down for generations and completely unknown to me, this guy weaved a long thin rope out of the bamboo by winding it around his toe. This he then threaded through small bands of bamboo, creating a very cool bracelet. After he had made two, we were presented with them and both Cesca and I wear them to this day. They have been through shower, seas, umpteen hot days and nights. Still they hold on. Obviously, this is a wondrous material, completely natural and yet strong as any Paracord. We bid goodbye to the villagers and headed out. This time we went via the road and walked for only a few hours before coming to a couple of guys holding an elephant. They indicated that we were to ride. I was not sure about this. Regular readers will recall our time in Chiang Mai where we worked on a sanctuary for abused elephants and I was not sure I wanted to ride one. The locals mistook my reticence for fear. “You climb, no worry, very safe,” one said, wondering at a European my size being apparently afraid of elephants. I still looked unsure. I was trying to see the signs of distress in the mighty creature, such symptoms as moving constantly form one foot to the other. The elephant regarded me with as much confusion as the locals. The talkative one tried a different track. “Very long,” his fellow volunteered. I sighed and reluctantly climbed aboard the gigantic animal. The Thai’s exchanged looks. Atop was a small collection of wooden planks to sit on, which had been strapped to the elephants hide. We set off at the languid and relaxed pace with the mahout gently poking the elephant to continue. I felt horrible. I had visions of the blind elephant I had fed bananas to. Her eyes had been put out by an angry mahout after she had disobeyed an order. She had been about to give birth. The mahout in his rage killed her baby and then burned out her eyes. You can imagine how I felt on the back of this elephant. She was right, it did. On the journey we passed villages, fields and many Thais working. They all smiled and I remembered why Thailand was known as the land of smiles. Buddhist countries have a natural instinct for happiness. At one point we passed a banana plantation and suddenly the elephant left the path. It crashed into the tall banana plants and dragged a fair size tree down. The mahout was hopping in anger, trying to get the beast back on the path, but the elephant simply ignored his ear pulling and the sound of industrial size banana plant eating, a sort of heavy crunching sound, reached our ears from below. Eventually the mahout regained control and the elephant wandered on dragging a huge plant along as a packed lunch. This was very funny. To us anyway. The next twenty minutes of the journey was punctuated by crunching sounds. After the vitamin potential of the giant plant was exhausted the elephant dropped it and around the next corner, we came to a ford. As the pachyderm entered the ford, his giant trunk stretched down to drink. Again, the mahout hopped with anger, and again the elephant ignored him and the sound of water being sucked through the creature’s giant straw of a nose made Cesca and I chuckled to ourselves. Eventually, the journey came to an end at the banks of a narrow river. There waiting for us was another set of villagers. We climbed down from the elephant and wished it goodbye. My guilt for riding it had not been assuaged, and I will not be riding one again if I can help it. We walked up to the river’s edge and I could see a makeshift raft in the water. The villager motioned us onto the raft, pointing that we should be positioned at the front and back. The water lapped over the logs as the raft dipped when we stood on it. I was just finding my footing when a pole was thrust into my hands. I turned to say something to the man, but he was already pushing us off into the rivers current. We were off and alone! Rafting, they say, is a job for the experience pole-man. If they were to make a film about the dangers of untrained raft handling, they certainly could use our journey down this fast flowing river as a guide of exactly what not to do. All we needed was the Benny Hill sound track. We shouted to each other like two demented Chuckle Brothers, “To you, to me!” and slammed the poles into the corners to try and turn in time, forcing the front of the raft under the water and threatening to catapult Cesca over my head and into the undergrowth on the bank. At other points, we missed the gullies through stony waters and ground to a shuddering halt, forcing us to try desperately to pole ourselves off the rocks before enough current had built to flip us both under. Luckily, no one saw us. After half an hour of this, I spied a straight section and a waiting Thailander half way down. We both conspired with unspoken agreement to suddenly look as professional as possible and glided up to the bank like experts arriving home from an Olympic timed run. With a professional nod to the man, who wasn’t fooled I think, I handed over my pole and strode like a true Englishman up the bank and over to our guide who had obviously driven down to this, which I suddenly realised, was the staging area from the day before. Lunch turned out to be unidentified meat on a stick, chicken hopefully, and mightily tasty. Cesca made herself at home by playing with the local kids, who clearly wanted our food, while I relaxed under the shade of a small canopy. After ten minutes, another British couple turned up and joined us and we got chatting. “I work for Paul Raymond,” said the man. Our final stage of the journey was to be driven to a train station and then jump aboard the Kwai Bridge train. This was a bit surreal as Cesca and I were rigged for jungle hiking and bedraggled from our adventures over the last day, and the train was full of day tripping tourists. Nevertheless, the old locomotive passed through the gorgeous countryside and we relaxed for the hour it took until our stop. At the stop, we jumped in a Tuk Tuk and were whisked back to the tour office that we started at a couple of days before. We tipped the guide heavily, something are a rule we never do, and Indeed have hardly done since, such was our pleasure at the running of this trip. She was very happy that it had gone well and we bid her a fond farewell before jumping on a bus back to the city. That evening, we decided that India was, “worth the risk.” I spent a few hours checking all the boards and websites and everyone said that the danger had passed. What would we find when we got there? The next day, we checked out and rushed to the airport. It had been one hell of a few days in Bangkok. People often talk of northern Thailand as the place to trek, and perhaps it is more beautiful, but I urge all readers to considered the Burma border area as, frankly, it is very quiet, full of happy people and very very well run. So, another chapter on our journey closed. I could not help feeling similar to how I felt leaving New Zealand; I did not want to. There are some many wonderful places in the world and to see them with the freedom of a traveller is something to be savoured and cherished. I had more eye opening moments in South East Asia in three months than in the rest of my life. A place asks you to look into yourself as much as you look out at it. The scenery is thick and in your face, the naturalism of the people is a clashing, jarring wake up call to the mind of someone from England. Someone from London. Everyone should come here and be challenged, puzzled, scared, cherished, massaged, fleeced, flattered, fed and watered. We climbed aboard the plane, and saluted South East Asia goodbye. What a continent, what a people, what a life changing experience. Three months in India beckoned, but I knew that part of me would always hold SEA in my heart.